The daffodils and tulips are well on their way to showering us with bright sping colours. In this month's newsletter we take a look at a few new pieces of stock including a lovely Troika Urn vase as well as starting investigations on a couple of pottery marks that fellow readers need help in identifying! An attractive Troika Pottery Urn vase, a lovely Troika Spice vase designed by Avril Bennet and a cute PenDelfin Family Circle rabbit Treasure. You can view our full selection of antiques & collectables for sale on the View All Stock page. This shows pictures of all the items we have for sale making it very easy for you to spot anything you might like or are trying to find! Here are two pottery marks that people need help in identifing. If you recognise any of the pottery marks or the pottery and can point the owners in the right direction then do let us know! Remember to check out our Pottery Marks Guide where you'll find a whole range of pottery marks and pottery dating advice...click here. "This mark is on a beautifully hand painted pitcher w flattened side at the handle, Worcester style. Note the extra piece at the bottom of the left stroke of the R that gives it a RL or LR look. Have had no luck finding it in our reference books. Doesn't look like any Worcester marks to us..."
"I have spent hours searching for this tea set mark without success, can you help with identifying it? We believe this to be an early 1900 cake/tea set. 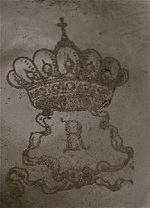 The photo shows the cake serving plate and a cup, the emblem is transposed from the bottom of the plate for viewing. The pattern on the plate is the same on all pieces. 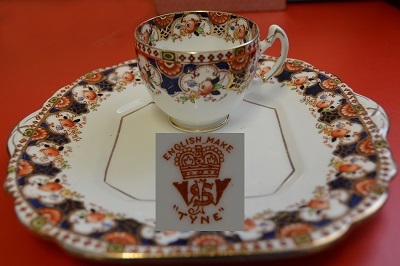 The set consists of the cake serving plate, 4 individual plates and 4 cups and saucers and a sugar bowl...All pieces have the emblem and the words English Made and Tyne as shown in the emblem in the photo..."
Can you identify these pieces of pottery or the pottery marks? If so, then please get in touch and we'll forward any information onto the owner. That's it for this month. Remember, do let us know of any Antique Fairs you visit - with spring gradually arriving it's always interesting to hear how the bigger fairs with outdoor stalls are doing.